This post comes from Leslie Stokman. 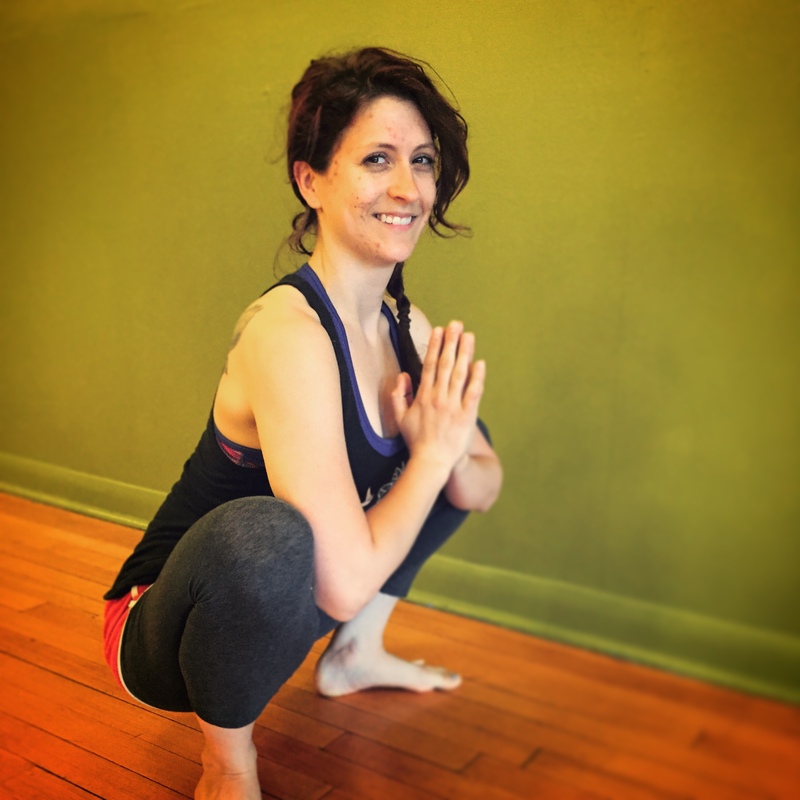 Leslie is QSY’s resident chalk-board artist extraordinaire, a recent graduate of our yoga teacher training program, and a SCOBY-growing Kombucha aficionado! What’s delicious, good for you, fun to make, and kind of like having a pet? 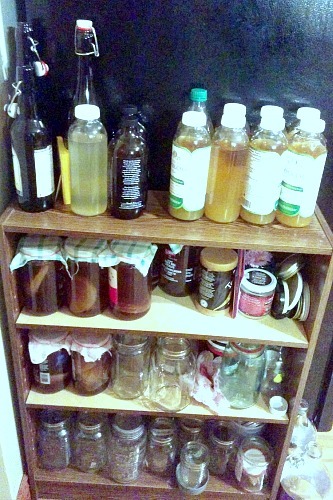 KOMBUCHA! 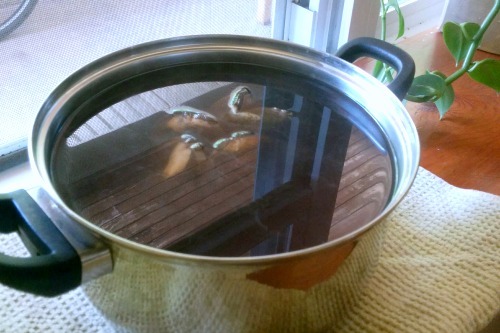 Read on to find out what it is, how to make it, and how you can get your hands on your very own SCOBY. Kombucha is something of a probiotic tonic, or just a healthy replacement for pop, depending on your way of looking at it. You can buy a delicious bottle at a health food store for $4-5, or you can easily make it yourself! Made with basic ingredients like tea, sugar, and water, it can be a refreshing beverage for hot summer days and a treat you can feel good about. 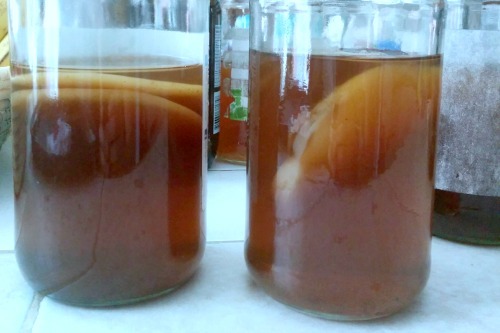 The other “ingredient” (though I like to think of it as a productive pet) is the SCOBY – a Symbiotic Culture/Colony of Bacteria and Yeast (and yep, it’s alive). Also called “the mother,” or a kombucha “mushroom,” SCOBYs are a firm gelatinous disc that do the hard work of fermenting the sweetened tea. After it’s fermented or enough time, you can drink it straight away, or move on for the second ferment. 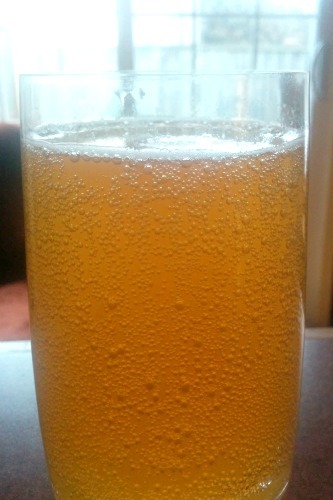 Strain (or just pour, the little floaty bits aren’t bad for you) the freshly-fermented tea into a completely air-tight container. At this point, you can add flavouring in the form of juice (about ¼ cup), chopped or blended fruit (for some reason blended fruit seems to create a faster/more intense ferment, so be conservative with it and careful when you open it), and other yummy stuff like grated ginger. 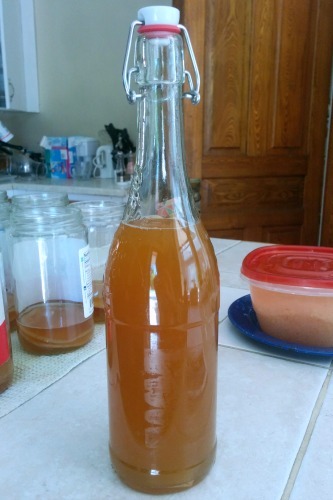 Seal the container and let it keep fermenting at room temperature for another couple of days (can be as little as 1 or as many as 3 or 4, but depends strongly on temperature, how sweet the original kombucha is, and how much more sugar [fruit] you add – I recommend the trial and error method). 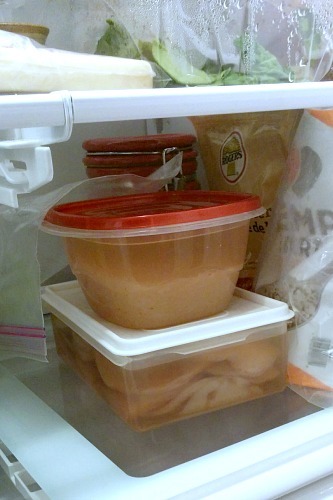 If you’re not ready to drink it right away, you can refrigerate it and save for later. Before you drink it all up, make sure to set aside a little bit of the freshly fermented stuff to act as a starter for the next batch. 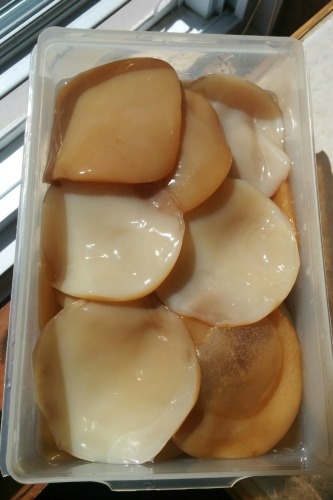 Your SCOBYs may grow layers on them (if they float at the top), or baby SCOBYs will form all on their own (if your mother SCOBYs tend to float sideways). You can use these to brew more and more kombucha, eat them straight up, flavour and dehydrate them as ‘candy’ or ‘jerky,’ give them to pets to eat, or if you’re really out of ideas, they can simply be composted. But seriously, try eating them. They’re just as good for you as the liquid itself. If you think you might have a kombucha explosion on your hands (say you let it ferment with blended fruit for 4 days… not saying I did that, at my parents’, after talking it up all weekend, but hypothetically…) then you can prevent a huge mess by doing the following: place the bottle you’re about to open in a big bowl, cover the mouth of the bottle with a big plastic zipper freezer bag, and holding the bag to the bottle with one hand, open it with the other. If there is a foamy overflow, the bag/bowl combo will catch it, so you can still enjoy the product and a clean kitchen. 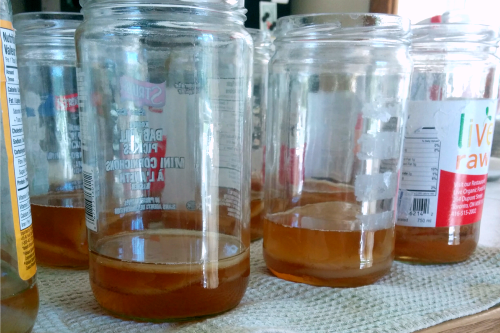 I’ve been brewing kombucha at home for the past several months, and have been able to reliably produce some really healthy and happy SCOBYs that I’d love to share with the Queen Street Yoga community. 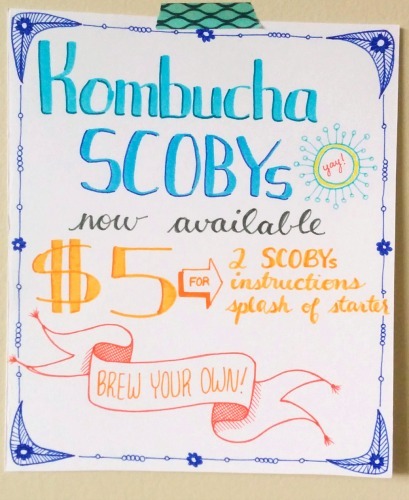 If you’re thinking about trying it out, $5 will get you two fresh SCOBYs, a splash of starter, and an abridged version of the above instructions. There is a tonne of great information about flavouring ideas and troubleshooting online, but if you catch me at QSY, feel free to let me know how your SCOBYs are doing and ask me any questions. Before long, you might end up with a situation like this in your house, too! Almost out of hand, but there’s a method to this thing!